Personalized Windproof Umbrellas Custom Printed in Bulk, 68". Promotional, Inexpensive, with Vented Double Canopy. Budget Prices in the USA and Canada. Withstand 55 mph winds! Bulk personalized 68" Windproof Umbrellas with Vented Double Canopy. We also supply wholesale blank (not custom imprinted) 68" Windproof Umbrellas for $14.50 each (minimum quantity: 25). 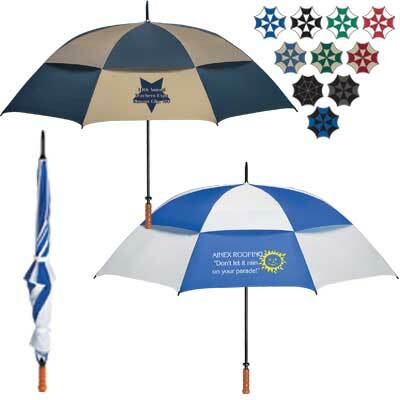 Budget Prices in USA and Canada for wholesale promotional 68" Windproof Umbrellas. American clients pay no taxes.